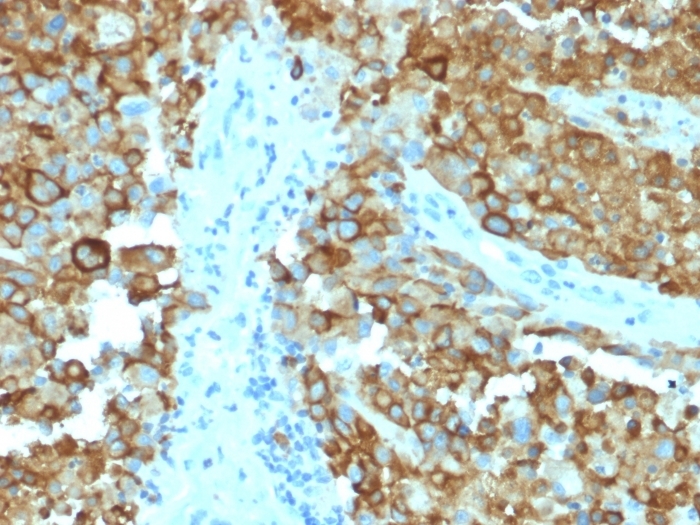 Formalin-fixed, paraffin-embedded human Melanoma stained with gp100 Mouse Monoclonal Antibody (PMEL/2038). 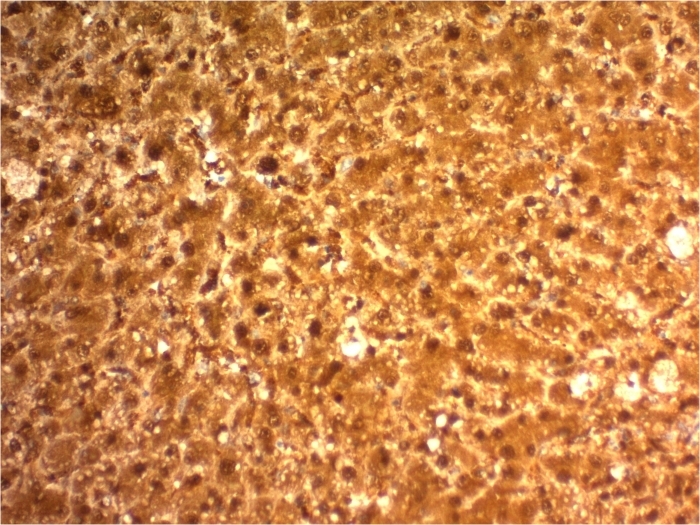 Formalin-fixed, paraffin-embedded human Skin stained with gp100 Mouse Monoclonal Antibody (PMEL/2038). 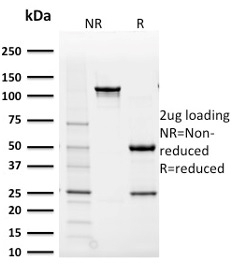 SDS-PAGE Analysis Purified gp100 Mouse Monoclonal Antibody (PMEL/2038). Confirmation of Purity and Integrity of Antibody. Analysis of Protein Array containing more than 19,000 full-length human proteins using gp100 Mouse Monoclonal Antibody (PMEL/2038). 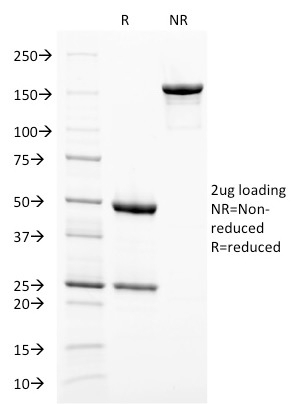 Z- and S- Score: The Z-score represents the strength of a signal that a monoclonal antibody (MAb) (in combination with a fluorescently-tagged anti-IgG secondary antibody) produces when binding to a particular protein on the HuProtTM array. Z-scores are described in units of standard deviations (SD's) above the mean value of all signals generated on that array. If targets on HuProtTM are arranged in descending order of the Z-score, the S-score is the difference (also in units of SD's) between the Z-score. S-score therefore represents the relative target specificity of a MAb to its intended target. A MAb is considered to specific to its intended target, if the MAb has an S-score of at least 2.5. For example, if a MAb binds to protein X with a Z-score of 43 and to protein Y with a Z-score of 14, then the S-score for the binding of that MAb to protein X is equal to 29. Optimal dilution for a specific application should be determined. Cytotoxic T lymphocytes (CTL s) recognize melanoma-associated antigens, which belong to three main groups. 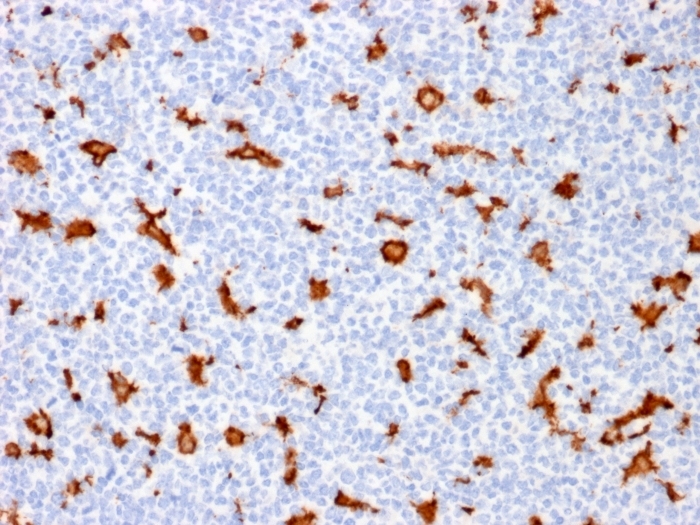 These groups include tumor-associated testis-specific antigens, melanocyte differentiation antigens and mutated or aberrantly expressed antigens, which are routinely used as markers to identify melanomas based on their binding to specific monoclonal antibodies. 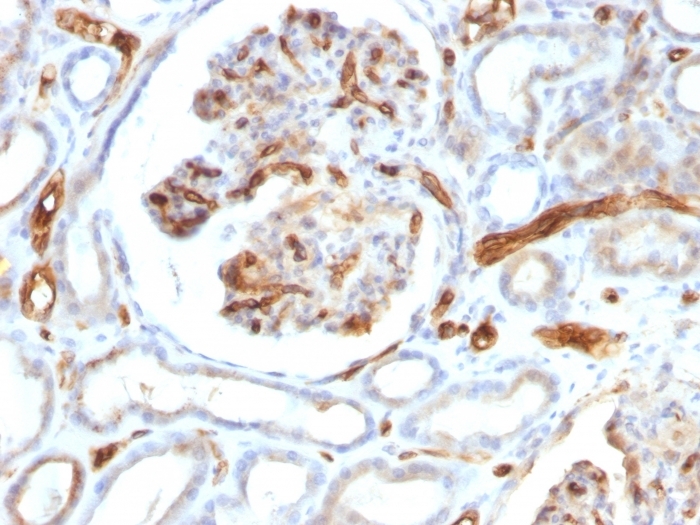 gp100, also designated ME20-M, ME20-S and PMEL 17, is classified as a melanocyte differentiation antigen and is expressed at low levels in normal cell lines and tissues, but is upregulated in melanocytes. gp100 is a highly glycosylated protein. It is also the product of proteolytic cleavage, which results in a secreted protein. 200ug/ml of Ab purified from bioreactor concentrate by Protein A/G. Prepared in 10mM PBS with 0.05% BSA & 0.05% azide. Also available WITHOUT BSA & azide at 1.0mg/ml. Adema, G.J., et al. 1994. Molecular characterization of the melanocyte lineage-specific antigen gp100. J. Biol. Chem. 269: 20126-20133.